Google Analytics is now the most widely used web analytics service on the Internet. Having the ability to use real web analytics statistics for your objectives is a breeze with Gtmhub. Profile or View ID - This ID can be obtained by navigating to the Admin panel of your Google Analytics account then selecting the desired set of Account, Property and View to display its properties. Once you grant the necessary permissions to read data from your account you will be able to choose the stat you want to pull data from. Select the entity you want. Then choose its sync schedule. 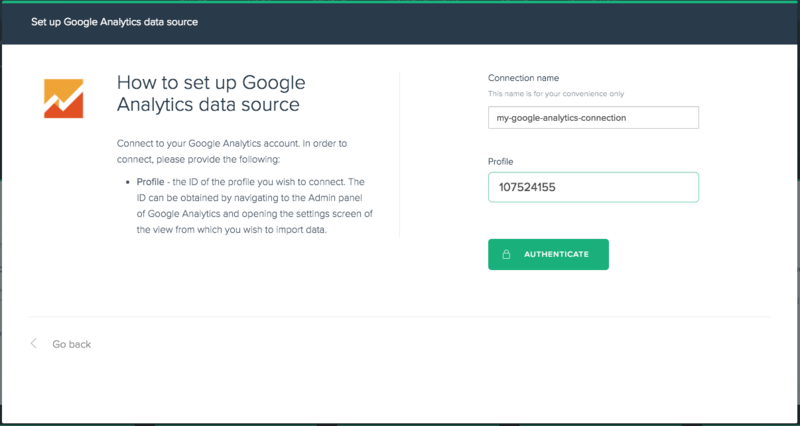 If you encounter such an error when you attempt to sync a data source it is most probably due to the fact that you have added multiple connections for the same Google Analytics account. Google provides an access token refresh mechanism only for one connection per application. Therefore any subsequently added connection will work for a brief period of time. To ensure the proper synchronization of your data - create all data sources using the initial connection that was added to your Gtmhub account. If this is not an option you can contact our support team for instructions how to revoke previous connections.